Often it is a 'hard' negotiation. This can be something like negotiating a new work project, agreeing on a salary increase or the price we'll pay for a house. But it can also be a 'soft' negotiation. Maybe getting your kids to do their homework (that's probably hard in a different sense), deciding roles in a team or handling staff conflict. Our approach to good negotiation isn't about winning and it isn't about someone else losing. It is, however, about learning to 'play the game' better, because that's what negotiation is - a game. Our negotiation programmes help people define their own rules and beliefs about negotiation and how they either support or get in the way of success. From there we look at each person's individual negotiation style and develop people's negotiation skills in being able to see better what's going on for other people, reading body language, and handling tricky meetings. We like to think our work is aspirational, with people getting a real feel and flavour of how the best negotiators work: with subtlety and flair; knowing what to give away, when to make demands and how to compensate when there are difficulties; how to let go of their positions, giving up one want and choosing another. Great negotiators can fight tooth and nail and yet lose with good grace when necessary. Not only that, they are a pleasure to negotiate with because they take care of you at the same time as taking care of themselves. 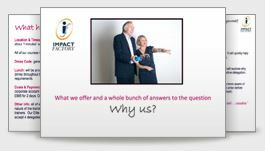 Impact Factory can help you become one of the 'good guys'. It seems some people are born negotiators and relish 'doing the deals'. The rest of us aren't and need some form of negotiation skills training to encourage us to put a toe into the fray. Maybe in your company, you may need a lot more than a toe when your people have to enter the negotiating fray. It may be that you have people who do need to do 'hard' negotiations such as union or other contracts, bargaining with suppliers, reaching a settlement. Extra negotiation skills training including understanding just how negotiations 'work', how to 'play the game', closing the deal and holding your nerve may be the very tools they need to make their jobs easier and less stressful when entering the negotiating arena. On the other hand, you may have groups of people who mostly have to deal with 'soft' negotiations, where it's less about 'what kind of deal can I cut?' and more about collaboration, cooperation and agreement. There may be people in your company who now have to include negotiating in their job descriptions when it was never expected of them before. If they aren't one of those born negotiators, they may well find this additional 'ask' quite challenging, even a bit scary. You could also have some old negotiating 'hands' who could use of brush up, new negotiators who find it a bit intimidating or uncomfortable, people who'd feel a lot more confident if they had some additional negotiation skills. All good reasons to give your negotiators a helping hand. Tailored specifically to each group our Negotiation Skills Training Programmes are designed to help delegates conduct successful, professional customer and client negotiations. Our Negotiation Skills Training can be tailored as an in-house programme to address specific issues within your company. Our Tailored Negotiation Skills Training comes in many formats from one-to-one through to fully tailored company wide programmes. We can run negotiation skills training at your premises, any third party venue or at our own London Training Suite at the Business Design Centre in Islington.